Katelyn Schaffer is very passionate about helping families through difficult situations. 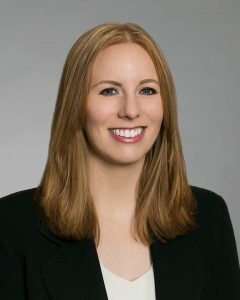 After double majoring with a Bachelor of Arts in Political Science and a Bachelor of Science in Marketing from Grand Valley State University, Ms. Schaffer began her legal education at Michigan State University College of Law. During her legal studies, Ms. Schaffer took an interest in the effectiveness of alternate dispute resolutions, and began pursuing this line of work by receiving both her civil and domestic mediation certifications. Ms. Schaffer utilized her mediation skills as a member of MSU’s advanced mediation team, representing the team during the semi-final round of the international mediation competition in London. Additionally, after receiving these certifications, Ms. Schaffer began mediating both civil and domestic cases through MSU’s conflict resolution clinic in courts throughout East Lansing, Charlotte, Mason, and Holland. Finding a passion for helping people through mediation, Ms. Schaffer took a nontraditional path by accepting a full-time position at Ottawa County’s Friend of the Court, while still attending law school. As a Friend of the Court Investigator, Ms. Schaffer conducted dozens of coordination conferences weekly for newly filed divorce parties; drafted hundreds of interim and ex parte orders; and testified providing recommendations to the Court. Working as a Friend of the Court Investigator for over a year, Ms. Schaffer gained expertise into the areas of paternity, custody, parenting time, and child support. She brought this experience with her when she joined Bank Rifkin as a law clerk. After graduating from Michigan State University College of Law and successful completion of the Michigan Bar exam, Ms. Schaffer began representing clients as an associate attorney at Bank Rifkin. Currently, Ms. Schaffer serves as a board member of the Michigan Association of Court Mediators, where she works to facilitate more effective dispute resolution techniques in the courtroom. Ms. Schaffer lives with her husband and two cats in Farmington Hills, Michigan. In her free time, she enjoys tennis, golf, yoga, and coaching a local high school tennis team.